The first time I tasted these delicious appetizers was from a recipe I found in a Neiman Marcus cookbook that was given to me as a gift from my sister many years ago. This cookbook is made up of a collection of recipes from everyday home cooks. It's not fancy, no pics either, but has been one of my all time favorites to get inspired from over the years. I love reading all the stories behind each recipe and I have discovered some real gems that have become part of my go-to collection. I always thought this recipe for Party Hot Ryes was a winner and it's the perfect appetizer for a game day crowd. When you bite into the tasty, toasted edges of the dark rye and make your way to the melted mixture of cheese, bacon and olives,..well.....it's just a scrumptious combination. Mix together all ingredients, except bread. 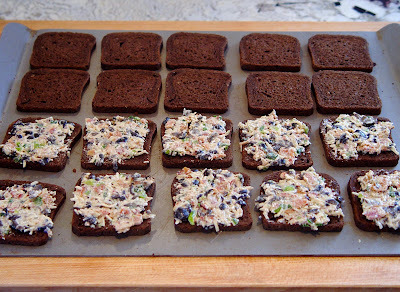 Spread on party rye bread and bake for 15 minutes until browned. These may be frozen after baking and reheated. 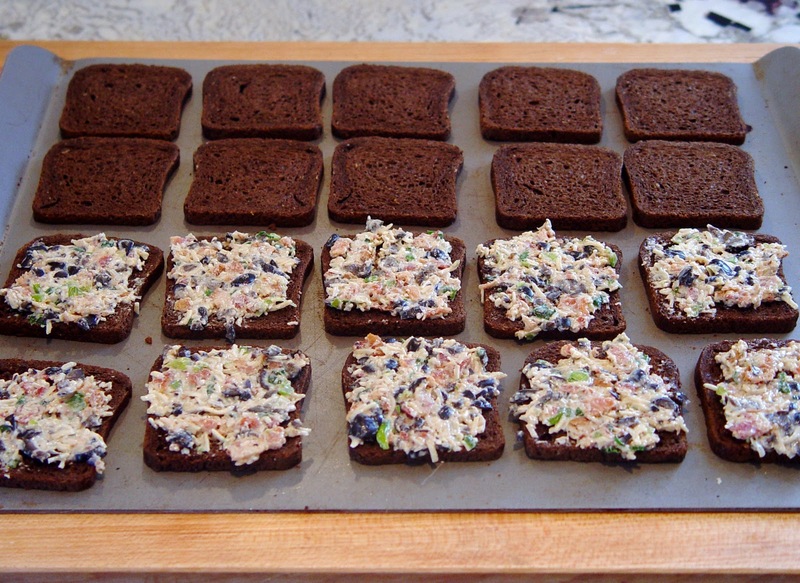 If you can't find party ryes, buy pumpernickel bread and cut into quarters. Mix everything together and chill until ready to use. Make ahead of time until ready to bake. These can even be frozen.